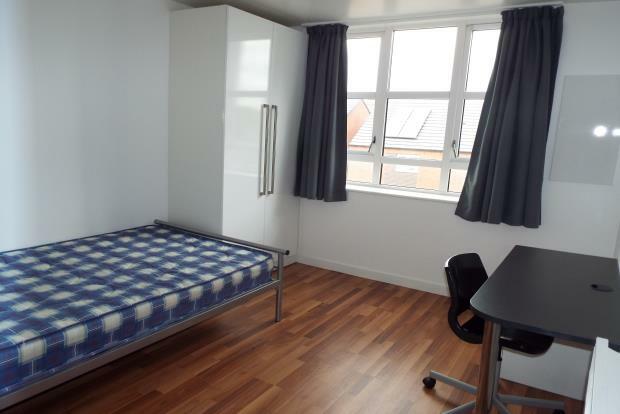 Apartment To Rent in Leicester for £470 per Calendar Month. If you are looking for a city centre apartment to occupy then this is the development for you. With modern white fitted kitchen units and a fitted oven and hob along with a fridge and open plan living area and bedroom with fitted wardrobes, chests of drawers along with a desk/dressing table. The shower room is finished to a high standard comprising low level WC, wash hand basin and shower cubicle with shower. The property is fully double glazed and has electric heating. All apartments will have access to laundry facilities located within the development. As previously stated these apartments have been finished to a very high standard and will let quickly. We are anticipating an enormous demand for this apartment due to its location and accommodation on offer.